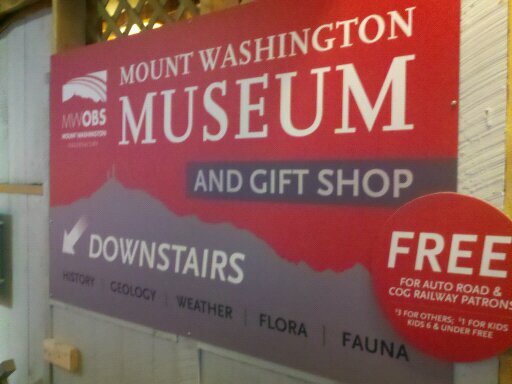 I went to a really nice event the weekend before last at the Mount Washington Observatory. We watched the sun go down from the highest point in the Northeast, champagne glass in hand. The weather co-operated with a crystal clear evening, and it was spectacular. The high point for me, though, was seeing some of our work prominently displayed at the entrance to the museum. This sign was printed on sintra, which is a foamed PVC sheet, on our UV curable flatbed printer. It makes a durable sign with great colors, and it’s affordable. You can send us a pdf, or a native file from any of the common design programs. Normal lead time for flatbed printing is a week, but we never lose a sign printing job over lead time! We can always find a way to meet your deadline. This entry was posted in Flatbed printing and tagged Flatbed printing, full color sign printing, plastic sign printing, UV curable printin. Bookmark the permalink.